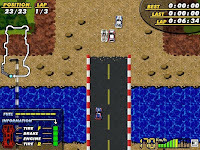 The player starts by racing in one of three classes: Stock, Rally or F3. Winning unlocks the following F3000, Endurance and finally F1. We can choose from three different ready made cars (the first of them being the only one with automatic transmission) or tailor our own in the garage, choosing from body, engine, gear and other specifics. When this is done, it’s time to race. 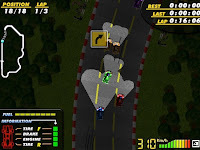 The scenery zips along at a fast pace, dozens of rivals are overtaken in a matter of seconds and the player needs to make full use of his reflexes. The challenge isn’t easy, requiring pit stops for gas and damage repair, and full attention to the circuit. One small mistake and we crash, loosing precious time. The different cars handle in their own way, so there’s the need to adjust to each one, making things more diverse and enjoyable. There’s more to F-1 Spirit than the single player mode, allowing for split-screen multiplayer up to 4 racers, and even a network mode. The graphics are really good, with the tiny cars getting a lot of attention, featuring different shapes and colors. We can see the shades of the clouds in the track, and there are occasional zooms to the player car, in a pit stop, for instance. 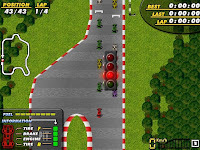 F-1 Spirit is a remake of an old school racing game that shouldn’t be missed. It’s fun, energetic and challenging and there’s nothing wrong with it, technically speaking.